Snorkeling can be fun for the whole family, but keep in mind that buying kids snorkeling gear is different from buying snorkel equipment for adults. Kids are smaller (and growing!) and have different needs than adults. 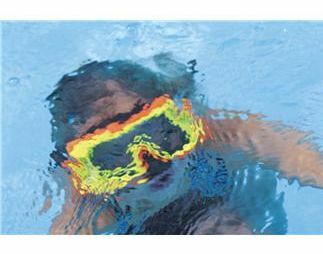 This needs to be taken into consideration when buying the best kids snorkel set for your little loved one. You want to get the most comfortable mask, fins and snorkel for your child so that he/she is comfortable and enjoys the experience. Nothing can ruin a snorkeling trip faster than a leaky mask (unfortunately, I speak from experience here). And the good news is that you don't have to buy the best kids snorkeling gear out there (read most expensive), just what is the most comfortable for your child. After all, they will outgrow it so you will have to invest in new equipment eventually. Because hopefully they will love it as much as you do! When buying a snorkel mask, of course the most important thing is to make sure it fits properly. It is important to ensure that the mask seals tightly to the face. This will prevent water from leaking into the mask and getting in the child's eyes. It is a good idea to have your child try on the mask before using it in order to ensure that it is sealing properly. 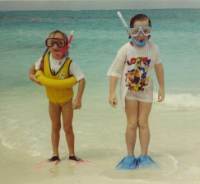 Kids snorkeling gear often has age guidelines to help parents determine if the masks will fit their children. Unfortunately, these guidelines do not work for every child so, if possible, have the child try on the mask. It is a good place to start though. If you buy it online, just make sure you are able to return it. Put Mast to Face - Put the mask up to your child's and stop when it is barely touching his/her face. Do not press the mask hard onto your face. Ideally the mask should touch all around your child's face at the same time. Examine the skirt - There should be no gaps between the skirt and skin. Check around temples and the smile lines between the nose and corners of the mouth since this is the most common area for leaks. Have Your Child Inhale - Have the childe sniff in lightly through their nose to to create a vacuum on the mask. The mask should stay in place without any straps or hands holding it in place. If they have to keep on inhaling to keep the mask on, try another mask. Exhale - Have them exhale through the nose to remove the mask. The most important step to getting the correct fit is to check the skirt as it is barely touching the face. The proper skirt fit will do the most to making sure the mask doesn't leak. Another thing to consider when buying kids snorkeling gear is making sure that the snorkel is the right size for your child's mouth. Snorkels are often too large for children to bite down on the rubber knobs in the mouthpiece. These rubber knobs help keep the water out of the child's mouth, so it is essential that the mouthpiece is small enough for the child to reach these knobs. It is best to buy a lightweight snorkel so that the child will not feel weighed down. You may also want to buy a purge snorkel for your child so that he or she can blow out any water that gets in. Another option that is available is a dry snorkel that keeps all water out. You can get more details on our page on dry snorkels here. Adjustable fins are also very helpful when buying kids snorkeling gear. 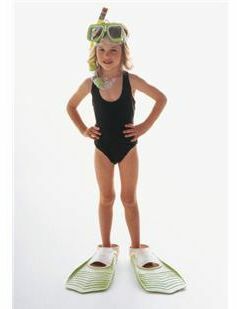 Since children tend to grow very quickly, these fins will allow you to adjust them to your child's ever-changing size. That way, you can use them for several years, as opposed to having to buy new ones every time your child grows. There is nothing wrong with full foot fins (have no adjustable strap), though your child will probably get less use from them since they will outgrow them faster. However, if they are more comfortable in them, I say go for it. Fins need to fit well without being too tight or too loose. If the fins are too tight, they will cut off the child's circulation. If they are too loose, the fins will fall off when the child tries to kick. You should also make sure the fins are flexible and not too rigid. Rigid fins are more difficult to swim in, particularly for beginners. It is also a good idea to add a wet suit to your bag of kids snorkeling gear. A wet suit will keep your child warm and allow him or her to stay in the water for longer periods than he or she would while wearing a normal swimsuit. When purchasing a wetsuit, it is important to make sure that the wet suit fits and is snug around the child's neck, legs and arms. This will keep water out of the suit and make the child warmer. You can read our complete free guide to buying kids wetsuits here. Depending on your child's swimming ability, a snorkel vest could also be important to add to your bag of kids snorkeling gear. A vest can keep them afloat with little or not effort so they can enjoy the underwater sights. Life vests can help children relax since they don't have to fight to stay on top of the water since it is a buoyancy device. For the added benefit of your piece of mind, most snorkel vests also come in highly visible colors so it is easier to keep an eye on them and pick them out in a crowd. In addition, if you go on a snorkel tour boat, many operators require that you wear snorkel vests (depending on what country your are in of course). If your child has his/her own vest, you won't have to worry about the condition of that rental piece of equipment. If you are looking for just a vest, a snorkel set or a complete snorkel set (snorkel set including vest), here are some quick links so you can jump right to the information you need. 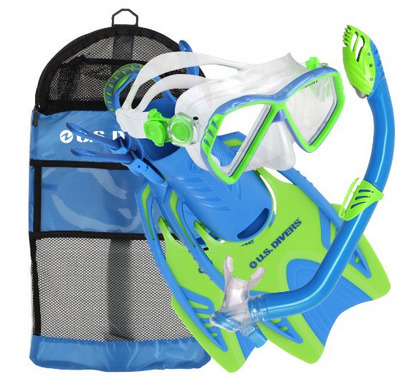 Snorkel sets are great for kids and can be very economical. You can usually save money by buying the whole set as opposed to buying each piece individually. Kids snorkeling gear has come a long way and there are now quite a few choices available. Because that is what is most important. That the parent felt the child was comfortable and safe and had a good time snorkeling with the equipment. I figured if the kids snorkeling gear works for most people, chances are you will have a good experience with it also. All 3 choices below have garnered lots of positive comments from parents (or grandparents as the case may be :) ). And, if not, all sets of snorkeling gear are easily returnable. Our first 2 recommendations are the most highly rated of the sets we found with lots of great reviews. Of course, these are priced at the higher end for kids snorkeling gear. Figures, right? As the old saying goes - you get what you pay for. However, I have also included a 3rd choice which gets the vote as best value snorkel set for children. It still gets great reviews (4.0 out of 5 as compared to 4.5 out of 5 for the first two choices) but is priced at a lower price point.It should, however, be more than adequate for a child. So if price is any part of your consideration, I wouldn't hesitate to buy the lower priced set. 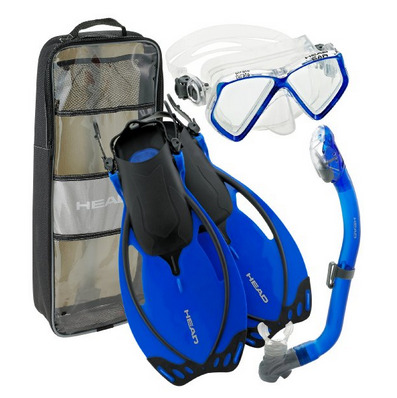 Our first pick for best snorkel set for children is a Head by Mares model. This model received a rating of 4.5 out of a possible of 5.0 based on 50+ reviews. It was a close choice between #1 and #2 but this set won out because it is at a slightly lower price point without sacrificing quality. This set features a dry snorkel which keeps water out while above and below water. This feature should help children get more comfortable with snorkeling. The mask is made of tempered glass and gives a nice clear view. This set comes with a handy carrying bag making it easy to transport. You can pick from 2 colors for this set - pink or blue. Get all the information on our #1 choice here. This second choice for best kids snorkeling gear set is a U.S. Divers model. It has received a rating of 4.4 out of a possible 5.0 based on 80+ reviews. This is a very similar to our first choice but the deciding factor, as I stated above was price - this set at a slightly higher price point than our first pick. This set also features a dry snorkel which is designed to keep all water out. It also has a pivot design on the foot which makes it easier to walk in them (according to several parents), as most children tend to do. This set also comes with a handy carrying bag making it easy to transport and not lose anything. There are also 4 different color choices, depending on the size. Reading through the reviews, most parents were very happy with the performance of this set. I have highlighted the pros and cons here for you. 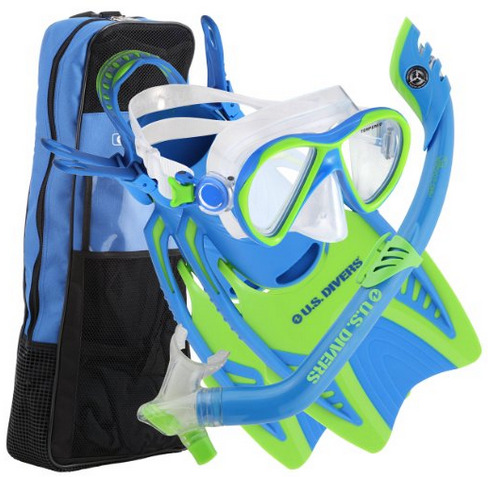 Get all the details on this US Divers kids snorkel set here. Our third choice for best kids snorkeling gear set and our best value choice (this is the lowest price point of all 3 picks) is another US Divers model. This set received a rating of 4.0 out of 5.0 and is very similar to our #2 choice with a dry snorkel, built in whistle and pivot fins. A few reviewers did mention the quality of the mask skirt made the mask uncomfortable. And I will say silicone is the most comfortable material for a mask skirt since it is flexible. However, the vast majority of reviewers didn't mention this and gave the mask high reviews. The other major negative I read for this set, unlike the other set, was that the mask clip broke off easily (10+ reviews stated this which is pretty significant). Some were able to have it replaced, some fixed with a rubber band, some returned. So with that being said, the vast majority of the reviews were positive. This is a slightly lower quality set but the price point does reflect that. It is just a personal choice here. Read all about this US Divers snorkel set here. If you already have most of your kids snorkeling gear and are just looking for a vest, we have some picks for you. All our picks are highly rated and come in bright colors so it will be easy to spot your child in the water, giving you an added degree of comfort. So let's see what our picks are for a child's vest. We have chosen three models of vests for your kids snorkeling gear. One is a one size fits all for children and two models come in both a child's size and adult sizes. 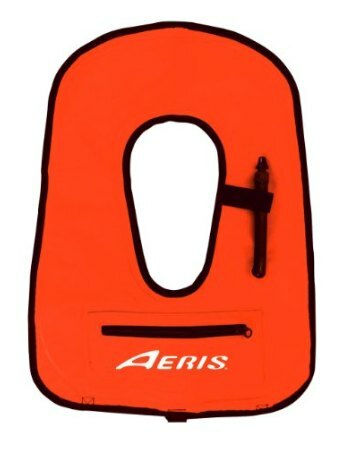 Our first pick for best kids snorkeling vest is an Aeris model. It garners great reviews from many users and has little negative feedback. 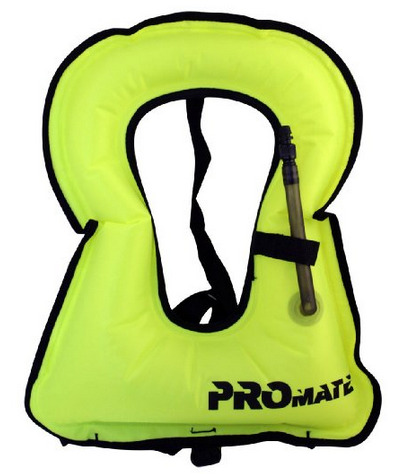 It comes in a bright orange color so you can spot your child easily in the water and also has quick release straps. It also has a zippered pocket on front which many wearers like since it can hold small items such as camera, defogger, keys, etc. The Aeris model comes in 3 sizes and the manufacturer states that the small if for kids up to 88 pounds. You can get all the details on this #1 pick here. Our second choice is a Promate model and also garners great reviews from users. Like the Aeris model it has a crotch strap for added security and comes in a bright color so your child is easily spotted. In this case, the vest comes in a day glo yellow. This model also has an adjustable waist so you can make it both secure and comfortable. This vest comes in 3 sizes with the smallest size for children under 80 lbs. Get all the details on this child snorkel vest here. Our third pick is a Tusa model and is very similar to the Aeris vest in features. It is a high visibility yellow color and also has an easy inflate/deflate valve. It also has a crotch strap for extra security and is very compact for easy traveling. This vest however does not have the zippered pocket on front. 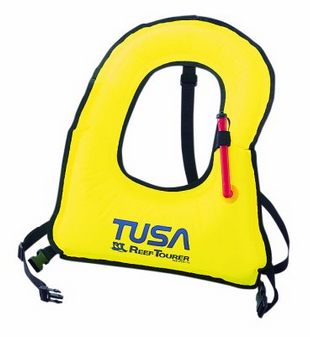 The Tusa model is specifically for children and it is one size fits all. 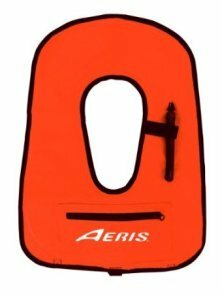 Find all about this pick for a child's snorkel vest here. 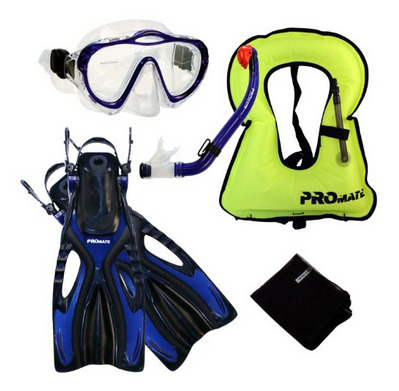 If you need a complete snorkeling set plus vest, you might consider buying it in one complete package. Here is a choice I think you would be happy with. As an added bonus, buying it all in one package could save you some money. And who doesn't like that? Sometimes it is easier and cheaper to get everything together. And if you are looking for a complete of kids snorkeling gear - the snorkel set plus the vest - this might be for you. This set gets lots of great reviews. It is made by Promate and has received a rating of 4.4 out of a possible 5.0. Not too shabby. This set includes mask, fins, snorkel, snorkel vest and mesh bag. The snorkel is a dry snorkel, keeping the water out while your child is out there with his/her head in the water. The mask has a silicone skirt and strap for a more comfortable fit. The fins are adjustable with an open heel design. This snorkel set comes in 2 colors, pink and blue. Get more info on this complete set of kids snorkeling gear here. We hope this guide to buying kids snorkeling gear will make your choices easier. It's a great activity to do with your child and you should both have some great times together. P.S. You might also find our mask, snorkel and fin guides helpful (mask, snorkel and fin guides are just as useful for snorkeling as they are for scuba diving).